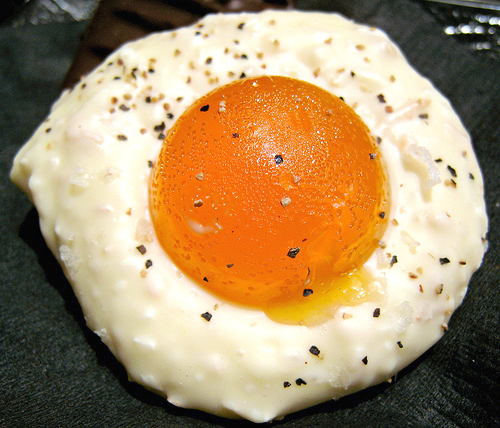 I got an email from a reader asking for help with fried eggs. Hi — I don’t know what I do wrong, but although I am generally a good cook, I can’t make a decent fried egg to save my soul. They either are all crispy and burned on the edges or slimy and yucky on top. If I try “over-easy” I get “broken yolk” as they seem to stick to the pan. If I use non-stick pans, I get a weird light brown on the bottom that is unattractive. I’ve got to admit I’m not the greatest fried egg maker. I’m too impatient, but I always know what I did wrong about three seconds after I did it. If I take my time and don’t try to work on too many things at once, I can do them. Here’s what I’ve learned. First, don’t be afraid of butter or bacon fat. The egg shouldn’t be floating on it, but I’ve come pretty close. Second, you can’t cook an egg faster by turning the heat up more. I love doing meat on super-hot surfaces, but with an egg you’ll get a burned bottom and a runny top at the same time. Not good. So take your time. Third, find a lid that fits over your pan and use it. Clear is better, so you can see how it’s looking, but you can use anything that fits tight enough to keep the steam in. Melt two or more tablespoons of bacon fat in a pan that is just large enough for the number of eggs you’re making. I’ll use a six-inch for two eggs. Don’t try to lift the edges right away. You have to wait for the bottom to cook before you can move the eggs around. Turn the heat sort of low — I can’t say exactly, since electric and gas stovetops have very different definitions of “medium” — and put on the lid. Check every minute or so, or look through the clear lid if you’ve got one, until the top of the yolk starts to turn white. That’s when you can safely flip them over. If I’m doing sunny side up, I’ll tilt the pan a little so the bacon fat pools at one side. Then spoon the hot fat over the top of the egg a few times to make sure it’s cooked on top. Another way I’ve seen at diners is to pour a few tablespoons of water on the hot pan next to the eggs and put the lid back on. The steam will finish the top so it’s not runny. The most important thing is to just take your time, which is why this is so hard for me. Keep the heat low, don’t tell yourself you can turn it up and “just keep a close eye on it”. It won’t work. I’ve never worked at a diner, so I’m sure there are lots more great tips. Who’s got a good one? Leave a comment and share the knowledge. By the way, that egg in the picture at the top is actually a fried egg truffle — white chocolate and fruit filling. Follow that link for some more amazing dessert pics.